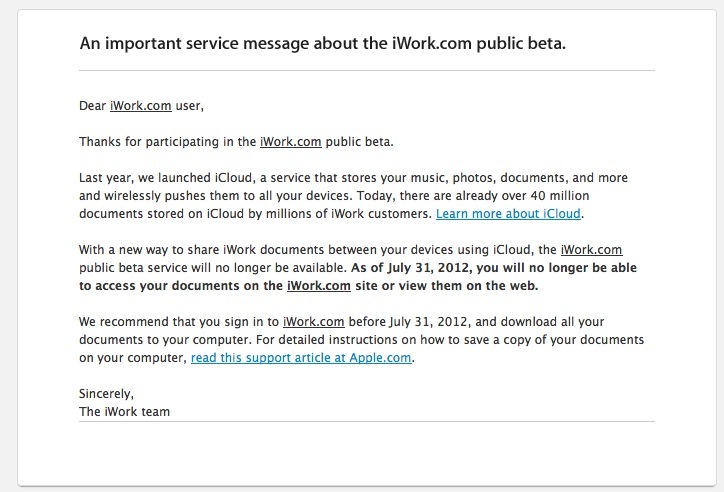 Apple has announced to iWork.com beta users that the iWork.com beta will be shut down on July 31st and recommends that users move on to iCloud for sharing iWork documents. The email details the closure of the service, which was launched back in 2009. 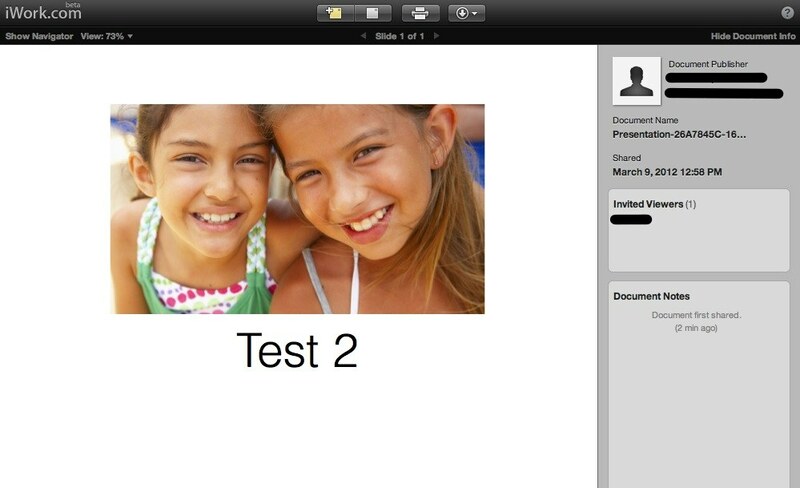 Part of what makes sharing your work using iWork.com so great is that viewers see your document, spreadsheet, or presentation just as you designed it, complete with layout, fonts, colors, graphics, and photos. And an intuitive interface makes everything easy to navigate and print. At this point, you can view iCloud documents at iCloud.com, and download them, but there are few collaborative viewing or sharing options available. Users can share iWork documents from the Pages, Numbers or Keynote apps with a simple ‘public link’ that allows downloading of a document, the recipients of the email can then view the document, download it and add notes. This capability is also offered to developers of apps that have iCloud integration. This allows them to offer ‘one way sharing’ of documents via iCloud. Whether Apple will eventually expand the service remains to be seen, but previous job postings have indicated that it was expanding its iCloud development team, so hopefully that’s in the works. Apple previously announced that it would kill off the MobileMe product and replace it entirely with the iCloud site, and has recently been reminding users that the deadline for conversion was June 30th, 2012. At a recent investor conference Apple CEO Tim Cook announced that the iCloud data syncing service now has over 100M users. Just last month, Cook said that the service had 85M users, making this a growth of 15M users in 21 days. Cook also reiterated that iCloud was a ‘long-game’ strategy that Apple would continue to pursue over many years. He said that it wasn’t just a product, but a “strategy for the next decade” of Apple’s business. For more about Apple’s iCloud service, be sure to read our complete guide to the service here.